Cloud Atlas is a very ambitious film that is very easy to hate. At 2 hours and 52 minutes of running time, it can be argued that it needed a bit of trimming and editing. The script, adapted to the screen by Tom Tykwer and the Wachowski duo of Matrix fame, is a hosh-posh of unoriginal fantasy with plenty of catch-phrases that would be a lot more effective in a less inflated and self-conscious film. The acting is average at best, combining the best Tom Hanks has had to offer lately with a cast that, for the most part, fails to match his chameleonic delivery. If we were to pick at every little thing with a stencil, this review would probably turn into an essay of several pages. Thankfully, the details that tend to annoy us as we are watching a movie tend to disappear in time, often in a matter of hours or minutes. What is left is the essence of a film, its underlying message or intent, and if it made us think and feel something of value. Cloud Atlas is flawed, no doubt about it, but there is heart and there is care in the message it tries to weave. Though it may not be as profound or as artistically relevant as The Tree of Life, it does share an interest in humanity that is contradictory, tragic, but ultimately hopeful. Visually, Cloud Atlas excels with an array of great scenes that showcase inventive camera work, convincing special effects and an unmatched level of make-up and art design. There are, in fact, a couple of scenes (a still of one of those is shown at the top of this post) that take your breath away, and that seem to belong to an entirely different film. Where Cloud Atlas fails is not on its noble and ambitious intent (which is soon made clear despite the many converging storylines), but on the inconsistency of its delivery, combining deeply moving sequences with cartoonish and silly moments that do not hit the mark. When one of Hanks’ many characters struggles to fend off his selfish and sinful tendencies towards the end of the film, there is enough depth in the story and in the characters for us to care about their faith; however, the way in which the inner struggle is shown is “caricaturesque” at best, failing to generate the kind of anticipation the director strived for. Like it, there are many other scenes that promise a great deal only to succumb to a general lack of ideas on how to best present them. Of the many stories that unfold parallel to each other, only two or three are crafted effectively, producing the kind of emotional response that they looked for in the audience. 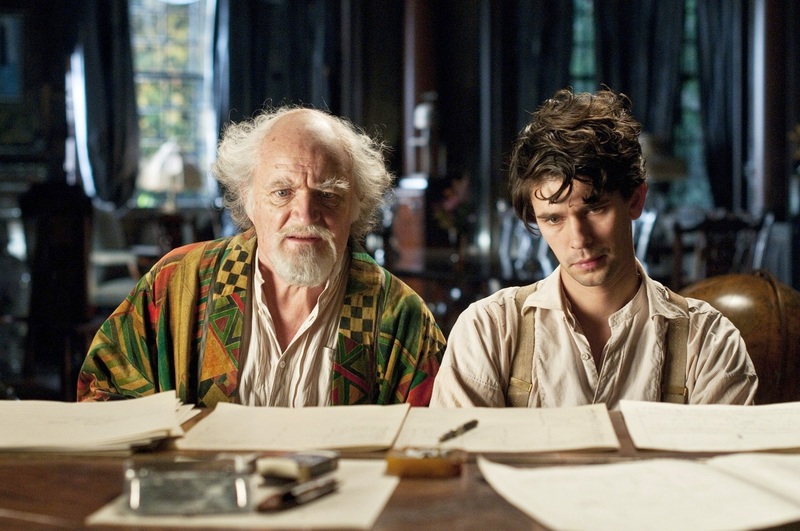 Among them, I was deeply affected by the tale of Robert Frobisher (Ben Whishaw), a young musician whose big dreams to become a composer lead him on a path that is full of misfortune. Unlike most of the other subplots, the tale of Frobisher works on multiple levels. First as a romantic piece, and then as a tragedy with a small yet deeply human triumph. For a film spanning close to the entirety of human civilization, with converging storylines of different feel and tone, Cloud Atlas comes remarkably close to hitting the nail on the head. If it had failed completely, it would not have made me care as it did. Suggesting that the good we do in this world can carry great importance in the grand scheme of things is a powerful and intriguing message that is worth pursuing, even if, in reality, it is nothing short of improbable. There were parts of this movie I really managed to enjoy (for example the man trying to escape the house for the elderly), but in general I wasn’t a fan. The man trying to escape the house for the elderly was pretty great I have to say. Next to the Frobisher story, which moved me, that was definitely my favorite. Cloud Atlas is pretty uneven, but I respect it for trying. Great new look Niels! I quite enjoyed this one actually. It has some flaws obviously, perhaps overly ambitious for its own good. So yeah I think 3.5 is fair. I figured I would update my look after taking such a long time off the blogosphere radar. Glad you like it, and glad we agree on Cloud Atlas. Thanks for stopping by. I was disappointed by Cloud Atlas. It’s a film that was soon forgotten. Wants to be an epic film about everything, but ends up being about very little. It had potential with good directors and actors, but only one of the stories I cared about(the segment Nostra mentioned).